I was talking to a friend, who is from Sri Lanka, and I told her I haven’t watched a Sinhala movie. I looked it up and learnt that the filmmaker was Italian. Surprised, I asked her about it. She told me that even though the director was a foreigner, and even though he had made a film about kids living a slum, he didn’t look at anyone with a foreigner’s gaze. “The movie felt quite Sri Lankan,” she said. 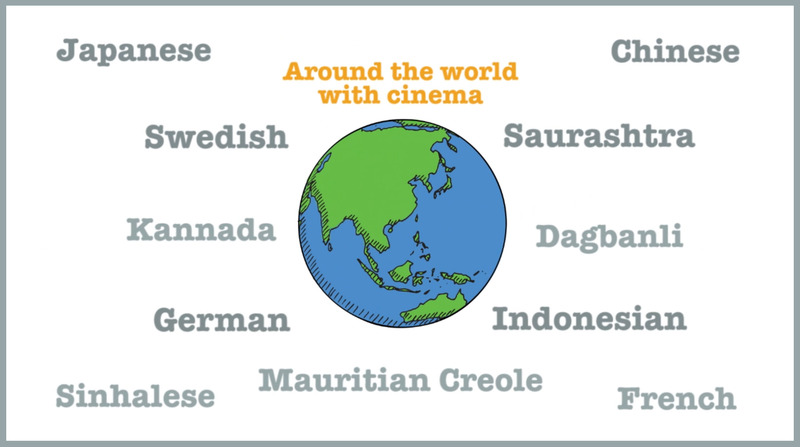 Hmm…to be honest, I don’t watch many Indonesian movies. But if I had to choose, it would be Pintu Terlarang, a movie in the thriller genre. Now I must think why I chose that! Hmm…because it kept me on my toes, kept me guessing. The colours and setting of the movie are also interesting. And as someone who enjoys slasher movies now and then, I’d say it entertained me with some good, gory action. I would like to recommend the film Amagi Pass. The lead actress Yuko Tanaka was so beautiful! The story is sad, but very impressive. Unfortunately, there is no English version. I’d recommend Pieli by Leonard Kubaloe. It’s a series that explores spirituality, complex temporality, and Traditional African Religions. The dialogue is breathtaking—it carries the essence of the Dagbanli language, it effectively uses the loaded concepts contained within the language, which cannot be expressed as effectively in any other language. –Wunpini Fatimata Mohammed, who is from the northern region of Ghana, where much of the movie is set. Keeper. It’s a short film by a friend of mine, Wassim Sookia. –Gitan Djeli, a cultural studies scholar from Mauritius, currently based in London. I’m not a big movie nut, but maybe I can come up with a few ideas. I’d like to recommend Ondskan. The title is hard to translate into English, but it’s a classic Swedish book turned into a movie. Also A Man Called Ove and As It Is In Heaven. I enjoyed A Man Called Ove a lot. It is not like classic cinema pieces, but a drama comedy which captures quite a lot of the culture, especially mid-20th century. And I like Saab cars, and the movie has a lot of Saab cars in it. Haha! But it’s beautifully shot and tells the story in a flashback setting. It begins with Ove trying (and failing) to hang himself in his living room—yes it’s a comedy, weirdly enough. Good Bye Lenin! describes the experiences of different people during the transition period, following the opening of the Berlin wall in 1989. Being from East Germany, a country that no longer exists, I can see how the movie captures the emotions and hopes of many East Germans for a better world beyond the walls of their seemingly perfect socialist idyll. But the transition with all its opportunities also alienated a whole generation of older East Germans, a sad situation which the movie depicts in many touching scenes. Good Bye Lenin! is a history lesson in the form of a personal and touching comedy. I’d recommend L’auberge espagnole. The majority of this French film is set in Barcelona, Spain. Since I am from a country that borders France and Spain, I find that this film portrays well the spirit of not being one or the other. L’auberge espagnole is a good representation of the ‘firsts’ that many adults experience, especially those who discovered and fell in love with Europe through the Erasmus exchange program. Hmmm. I think there has been only one film [Keestu] produced so far. Oh, there’s another one. Horat Hono [The wedding must happen]. No. They aren’t very good. Oh, there seem to be some short films too. I’m going to watch one now. Thithi. It’s a funny, thought provoking and award winning movie. It’s a very different kind of Kannada film. I was greatly impressed by the film To Live. It was one of most renowned movies, but it has been banned by the government. It talks about strength and courage, and the recent history of China. Thank you for enthusiastically sending us suggestions, you know who you are! Read more of this series here.